the latest food52.com challenge-use maple syrup in a recipe. easy enough, right? but the thing is, too many recipes with maple syrup also use maple flavor and that is something that i do not care for. 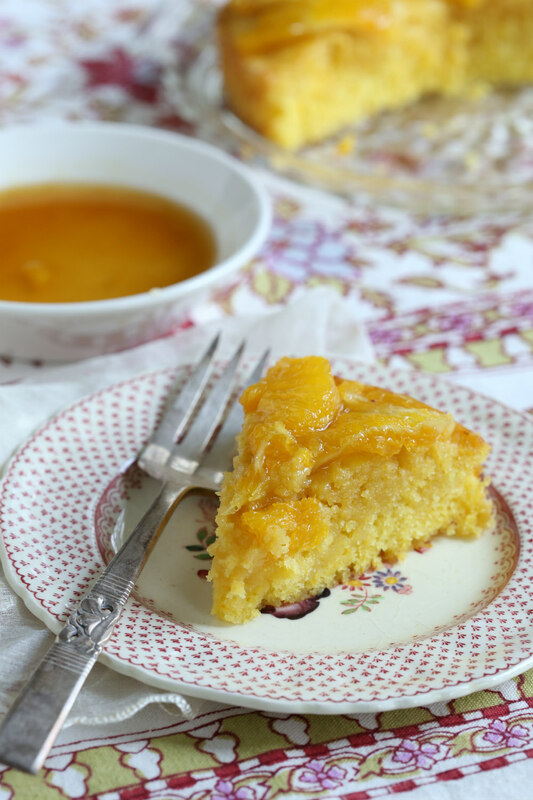 maple syrup is a subtle flavor that when concentrated, it can be cloying to the palette. that is probably why i hate pancake syrup and if i am going to eat waffles or french toast, the syrup will be a pure maple or it will be skipped. so with my distaste for cheap syrup in mind, i let my mind wander and ponder what i could bake with the bottle of grade b maple syrup sitting on my pantry shelf. wait, grade “b”? yes, grade b. why “b” and not “a”? flavor, plain and simple. 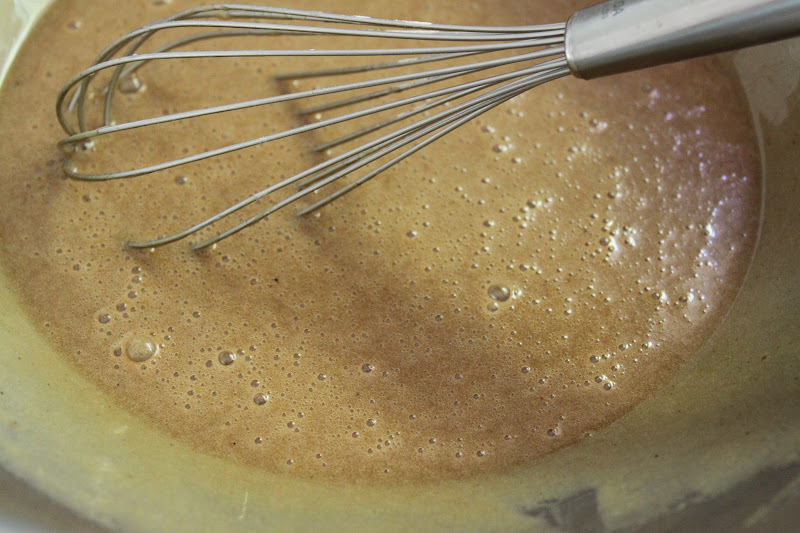 grade b has a stronger flavor that grade a, it is also a little darker but in my book, it is perfect to bake with and no maple-like extracts are required. to find grade b, look in the syrup section of some supermarkets-possibly publix, or head out to whole foods or trader joe’s since both carry a selection of grade b maple syrups. 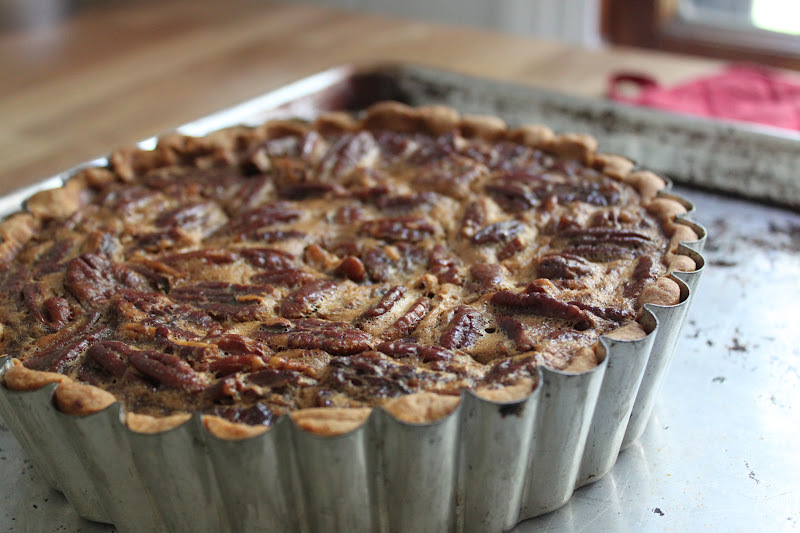 the plan is to make a pecan pie in a tart pan but with some liberties to the standard recipe. 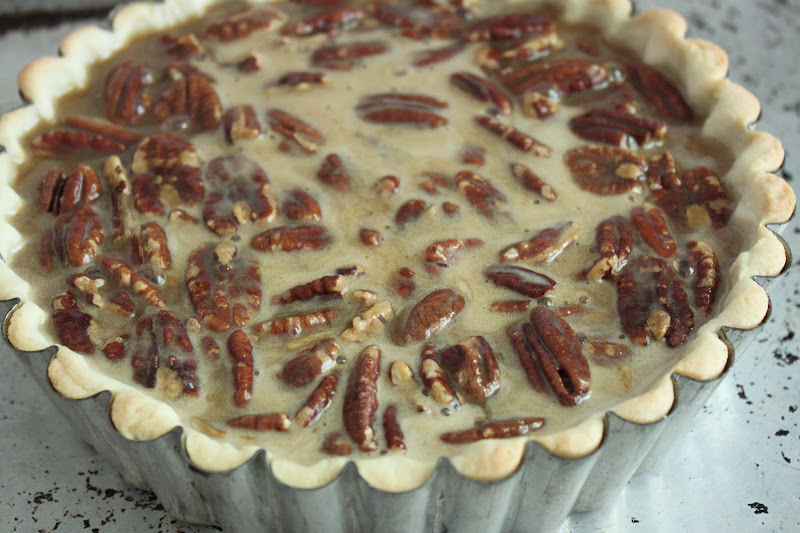 for a perfect pecan pie-and trust me, i make hundreds of them, one must mix the filling ingredients in the proper order or the butter will separate from the filling and spill out of the pan during the baking and leave you with a puddle in the oven and a pie that almost looks deep fried. 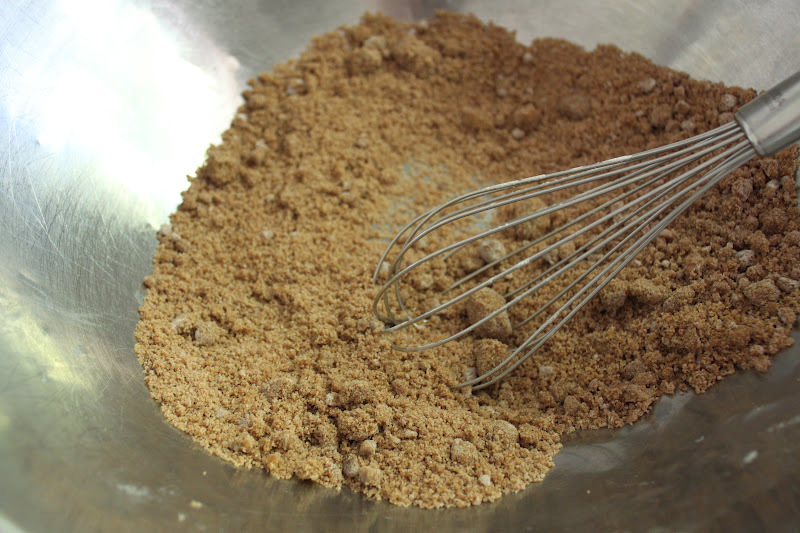 place your sugar, spices and flour (if the recipe calls for it) in a bowl and whisk to combine them. break up the lumps so that when you mix the filling, there aren’t any large sugar lumps left to sink to the bottom of the pie. 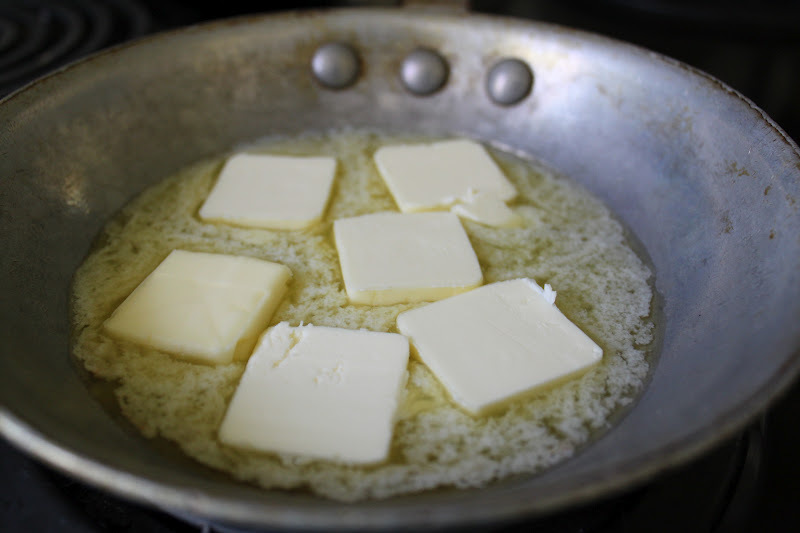 melt the butter slowly-warm butter works better than boiled butter in the next step. 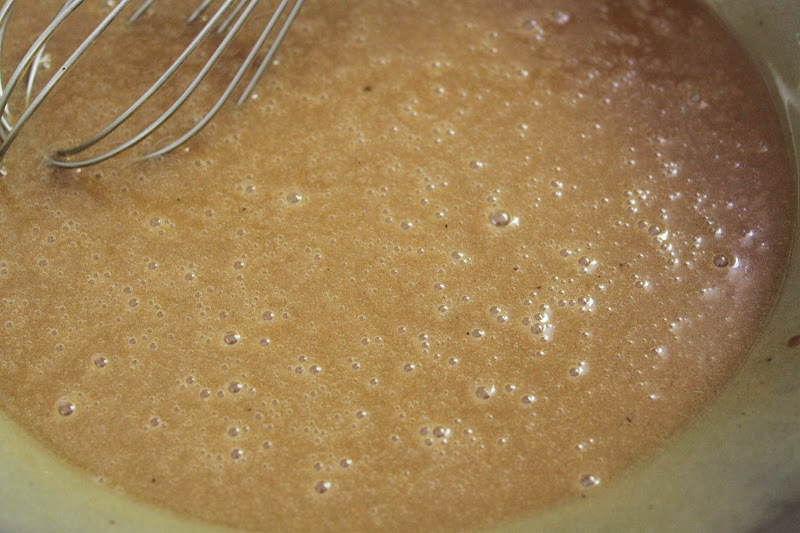 in short, you are creating an emulsion. 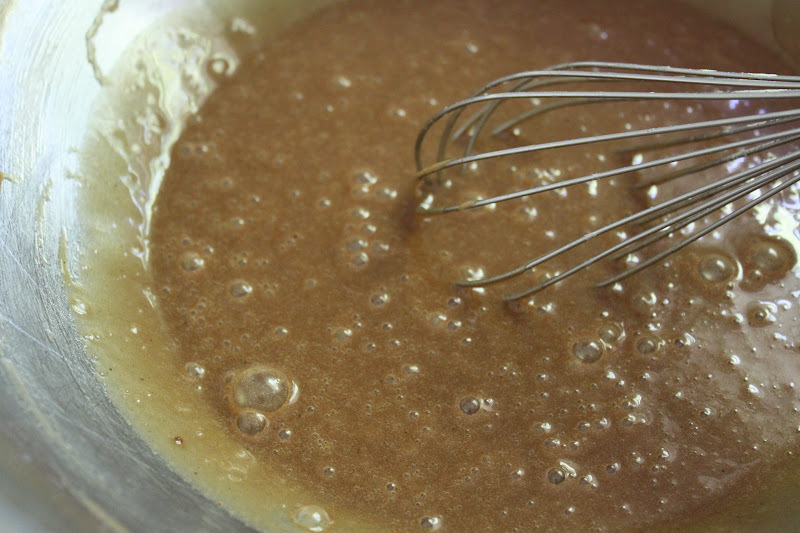 add the butter and vanilla and/or other flavors to the brown sugar and whisk to form a smooth, glossy paste. egg #3 added and whisked in here. do you see the difference in color? 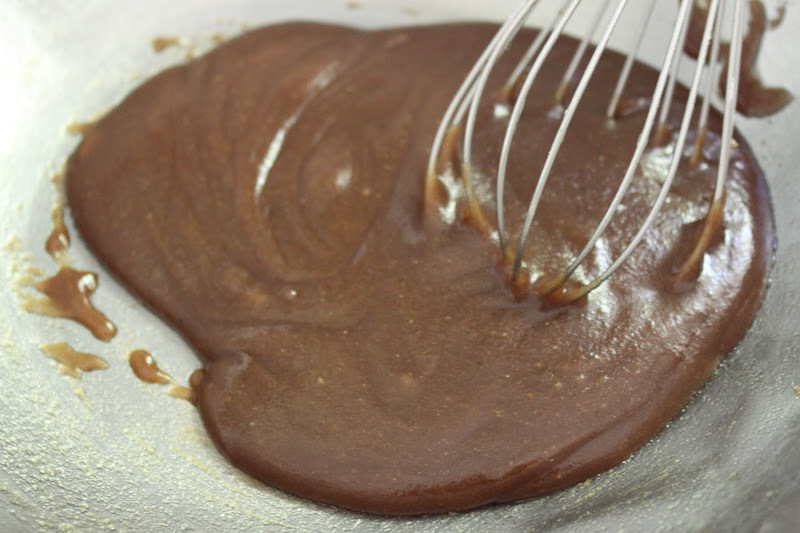 it is nicely combined and the butter and eggs are blended together so that the filling will not separate in the oven. 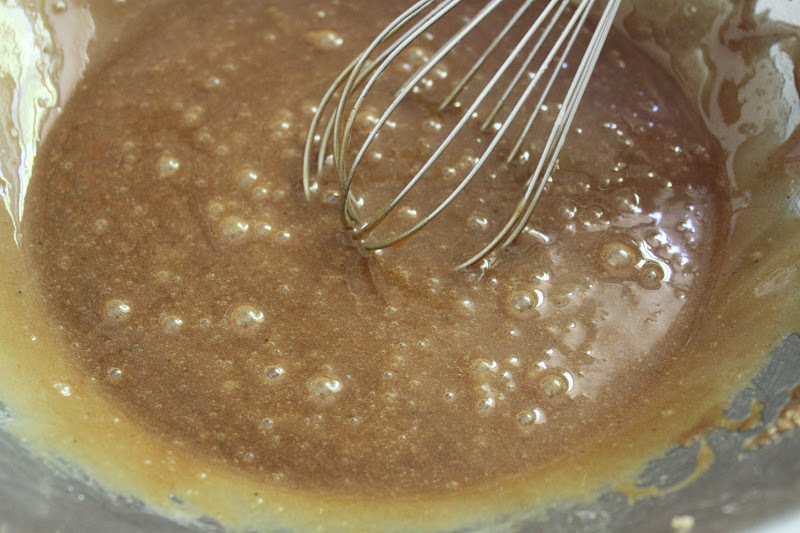 last step to make the filling is so add the syrup-in this case, it is maple and corn syrups that are added. 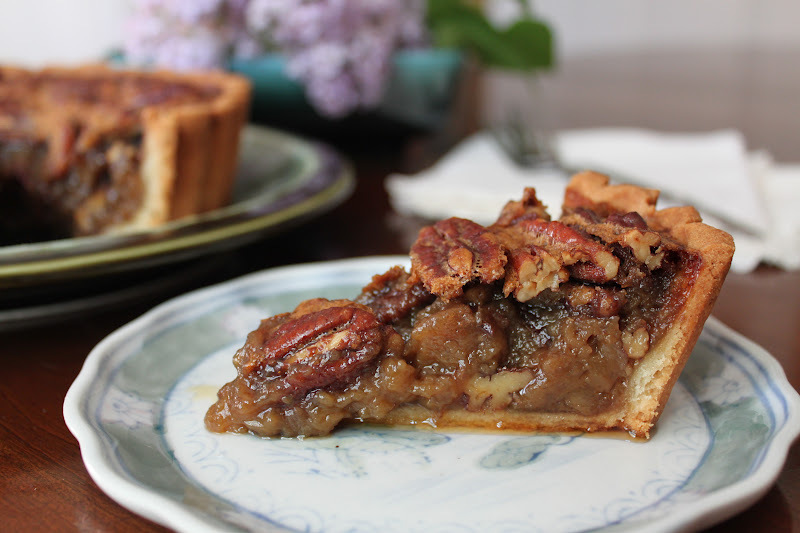 to get a perfectly baked pie or tart, one must start with a partially baked shell. 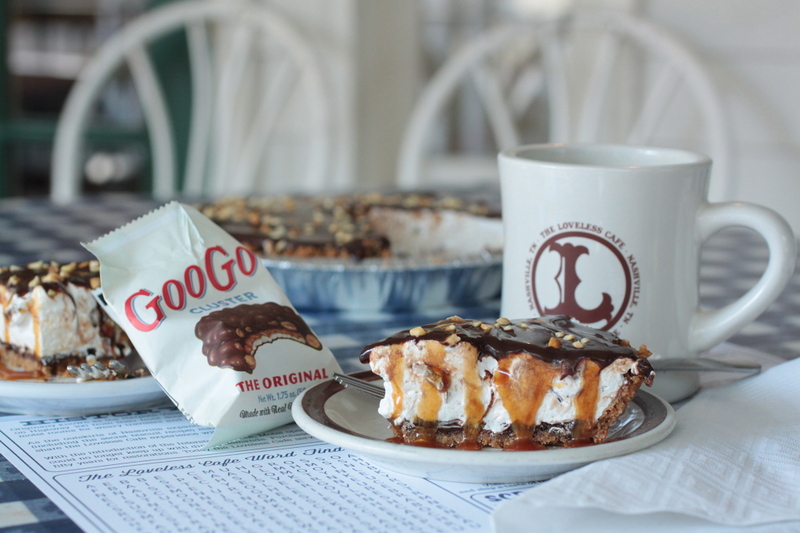 there is nothing worse than getting a forkful of gummy under baked crust along with a bite of pie! here i use my favorite trick-a restaurant sized coffee filter and marbles. coffee filters are designed to hold a large amount of wet grinds without tearing. 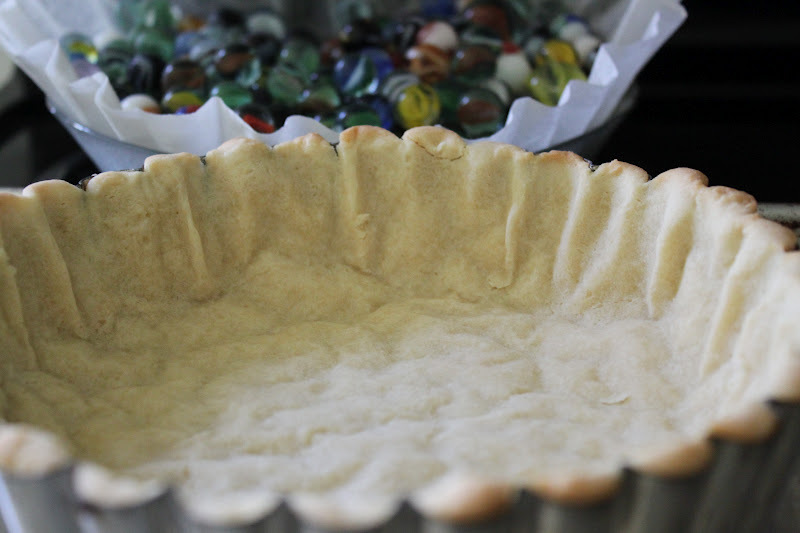 they absorb a little of the grease so that it doesn’t stick and you can literally lift the filter with the weights right out of the tart shell and set it aside to cool. 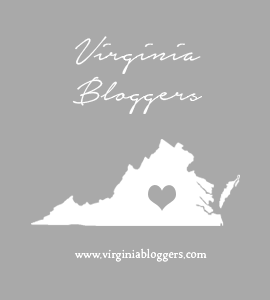 filters do not get brittle like parchment, they do not cause creases and cracks like foil and they do not melt like wax paper so if you can get ahold of some, give it a whirl! and just so that you don’t think i have lost my marbles, those are my pie weights! 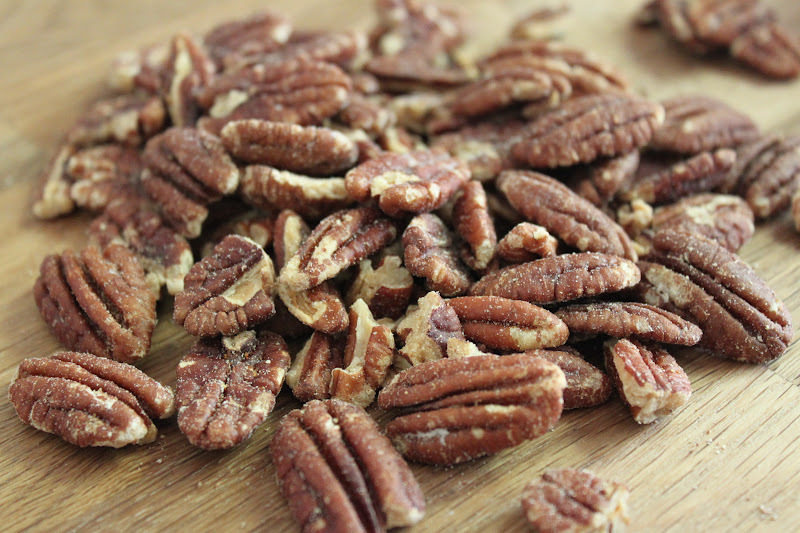 while any pecan would work, i like the smoky flavor of pit smoked pecans. it adds something to the tart and the way the flavors of maple and smoke (think bacon without the pig here) work together transcends a basic dessert staple into something really special that will have them reaching for seconds. to amp up the flavor, i also added a little dry rub to the filling but you could skip that and if you are really adventurous, you could try using a little ground chili to add another dimension. place the nuts in the shell and pour the syrup over them-this gets them coated with the syrup and the ones on top look shiny and taste a little caramelized when the tart is fully baked. 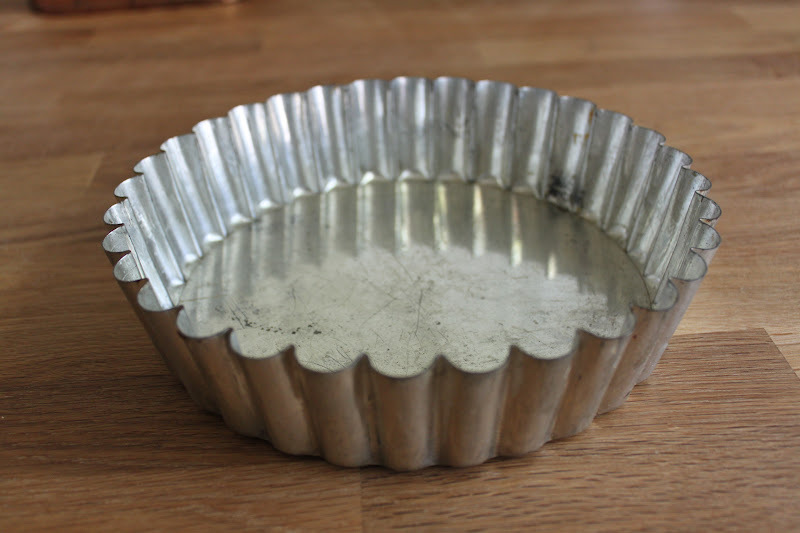 let the tart cool completely in the pan then remove it-a warm tart will break pretty easily and the fluted shape of the crust tends to create weak spots so heed the advice and just wait.